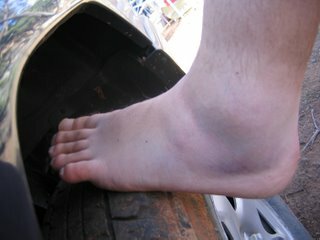 With the increasingly fragile Weeks, R having succumbed to a suspicious Achilles enthesopathy only one game into his comeback (urethral swab result pending), the injury-riddled Fish limped onto court 2 for their first ever game against traditional rivals, the ironically-named 'Air Supreme'. The courage of the Black Fish in even putting together 5 players brought a lump to the throat, and certainly drew a large crowd. While Goodwife Whittle resumed scoring duties, it was the courtside debut of future cheerleader Immi Noutz that had tongues wagging. Her magnificent work with cries of 'Mighty Black Fish' inspired all of the on-court contingent (and undoubtedly threatened the incredibly physically unimposing 'Air Supreme'), while her use of the clappers reminded us all of Richard's 'injury'. The game started with a high level of intensity, no better characterised than by 'Wrecking Ball' Noutz's 4 fouls within the first 16 seconds of the first half. Despite dominating play across the court, the Fish found it difficult to impose themselves on the scoreboard in the first half. The brave decision by Supreme's chief playmaker to take every shot despite his slightly worrisome zero percent from the floor may have contributed slightly to the Fish's narrow half-time lead. The second half was highlighted by several atypical events, and one very typical event. Typically, the Fish regrouped at the long break and came out firing. The game was effectively over within minutes of the second half as the mighty mighty Black Fish dominated play and drew away to a clear lead. Less typically, 'Runaway Train' Noutz managed to survive the whole game without accruing another foul (but still steamrolled a few of the little 'Supremes' who sorely deserved it). Even more bizarrely, the Supremes, having established an unassailable deficit, and giving away several hundred kilograms to the Fish at the pre-bout weigh-in, decided to impose themselves physically on the encounter. What followed was a series of dissatisfying minor stoushes, mostly featuring weak pushing and a bit of scratching by the Supremes. The Fish took the moral high ground and simply ground out an impressive 28-8 victory. All five Fish players contributed magnificently to the percentage-boosting victory: Nissen's defensive game continues to impress, Noutz was a massive physical presence (and has a sweet touch from the charity stripe), Rodgers, N continued his role as Chairman of the Boards, Whittle salvaged an unimpressive game with a huge three-pointer (and excessive celebration) at the buzzer, while Edwards played possibly his finest game in a stellar Black Fish career, his solid defence and smooth moves in the offensive keyway setting up the team's massive victory. A fine effort by all. Don't miss this week's huge clash as the Fish resume hostilities with the Monchhichis. Ah yes....Round 10 - it seems like only yesterday. The injury-depleted Fish took to court 2 for the late game against traditional rivals The Fakers. Even the entire cheer squad was apparently severely injured, as not one of them turned out for this crunch game. An otherwise unremarkable match was highlighted by the excellent bout of fisticuffs on court 3 moments prior to the opening ball-up, and by the first ever Black Fish match report to feature the word 'fisticuffs'. 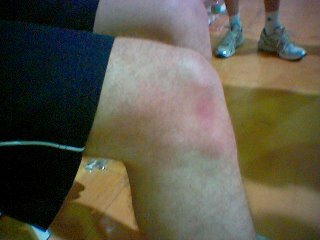 Perhaps an even more significant occurrence was the long-overdue return to the court of former better-than-adequate player and serial knee injury victim Richard 'Python' Weeks. Weeks signalled his intentions early with an audacious drive and low-arm finger-lob that caught nothing but net, and his sublime work at the point added much to an already skill-replete team. Unfortunately for the Fish, who bravely fought out a physical and highlight-packed match, their Faker hoodoo was destined to continue as they succumbed 28-36. As this fine side enters the depths of the mid-season they will be forced to dig deep in order to remain in the top four. Fish fans, there can be no surer bet than that your boys will call on all their reserves of skill and commitment and surge back towards the top of the ladder. Our thoughts are with you as you recover from injury. From the entire Black Fish family. Doesn't look so impressive here does it? Rest assured, Fish Fans, this is one of the worst injuries in Black Fish history. 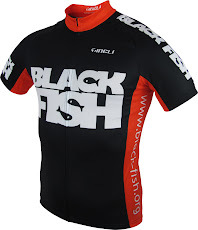 A nightmare round for the mighty Black Fish has rocked the club and required your humble correspondent to take a full week to digest the events before posting this match report. A confident Black Fish unit took to Court Three for the late fixture against traditional rival, the monkey-backed Spectrum, featuring first-gamer Big Carl Noutz in place of 'ill' nancy-boy Rodgers, N, and a debut appearance courtside by the Goodwife Edwards. A tense first half was characterised by steely defence from both sides - it appeared that the capacity crowd was in for a tight encounter. But then three major events were to define the remainder of the game. First, in a sickening collision, the nimble-footed Rodgers, A, returning fresh from a brief period in the reserves, drove hard into the offensive keyway, only to be met by the fearsome bulk of a couple of Fat Spectrum Bastards (FSBs). It was only after the laughter from his Black Fish teammates had finally diminished did the crowd notice that the brave number 6 had failed to get up. Fortunately two Rheumatologists were on the court to provide a definitive blank stare and shrug of the shoulders before Rodgers, A was unceremoniously dumped on a courtside bench, allowing the main game to resume. The sting has not long returned to the encounter when club stalwart Vasilunas suffered a gut-churning ankle inversion injury. Sadly for him, a normally impressive injury was diminished by the Fish's empty reserves of ligament-sympathy and he was forced to continue playing in order to support a shell-shocked Fish side who were increasingly more intent on checking the integrity of their own suspensory ligaments than maintaining a solid zone defence. Just when it appeared the game was slipping away, the mighty Fish rallied to come within a few points of their opposition. It was then that first-gamer Noutz showed his true BF spirit by launching himself over an opponent in a gravity-defying leap involving at least two twists and a somersault (in the pike position). It was a moment which will live on in the memories of those at the game for eternity. Unfortunately, neither that effort nor some bombs from downtown by LeBron Whittle were able to prevent an unfortunate 16-24 defeat. The Black Fish were, of course, the moral victors, leaving them in first place on the Moral Premiership ladder, however in a controversial move the management of the MARS League have decided to arrange finals based only on the real premiership ladder. This adds to the pressure and excitement as the Fish look forward to their Round 10 clash with traditional rivals The Fakers, featuring the first game in 2006 for former fringe player Weeks, R. Don't miss it. A bye allowed the Fish to enjoy a top-notch episode of Lost.